Her pet bulldog has its nails painted pink at Harrods, she owns a car turntable so she doesn’t have to reverse her Ferrari into the road and there are 100 pairs of Christian Louboutin heels in her walk-in wardrobe. So it’s perhaps no surprise that the lavish lifestyle of Tamara Ecclestone has not exactly won her many friends in today’s financial climate. Now, however, the 27-year-old daughter of billionaire Formula 1 boss Bernie, has come up with a bold plan to redeem herself – by going for the sympathy vote. She has attacked those who assume she is a ‘monster’, and claimed that, despite her immense fortune, she is ‘vulnerable like any other girl’. But she did accept that she is a ‘prime target’ for criticism given the gloomy economic conditions. ‘I’m naive, impulsive and sometimes don’t think things through,’ she said. But she added: ‘People assume I’m a monster, have no emotions, and bad things haven’t happened to me. I’m vulnerable like every other girl in the world, good days, bad days, arguments with my boyfriend. Whether her latest project will help improve her popularity remains to be seen. This week the model and TV presenter will appear on our screens in a Channel 5 reality TV series about her life called Billion $$ Girl. She said: ‘Viewers couldn’t have a worse opinion of me, so I’m in a win-win situation. This is my right to reply. It’s a bit of fun. If they’re going to hate me, they will.’ But she admitted her mother, ex-Armani model Slavica Ecclestone, at first thought she was a ‘lunatic’ for agreeing to the show. Last week Miss Ecclestone revealed her astonishing walk-in wardrobe, which includes around £70,000 of shoes, £100,000 of handbags and designer dresses that she usually only wears once. And in the latest insight into her extravagant lifestyle, she tells how her dogs are cared for at Harrods’s pet salon, where her bulldog not only receives a facial, but also has its nails painted pink. 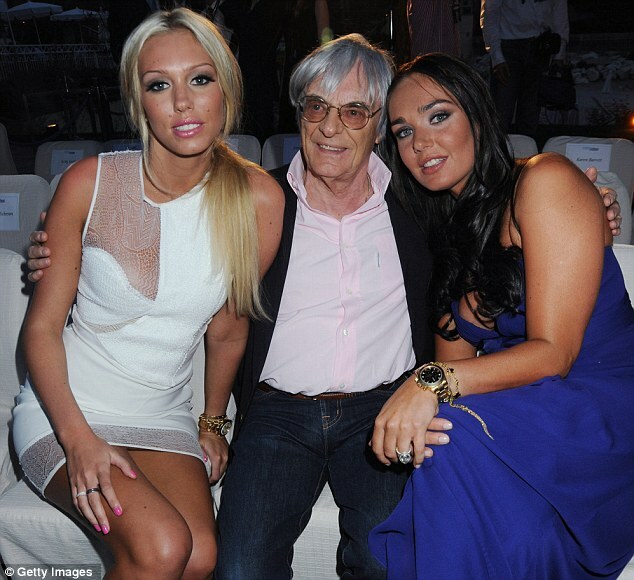 Miss Ecclestone is dating stockbroker Omar Khyami, 37. This summer he bought her a Ferrari 599 GTO, worth around £370,000. She said of him: ‘It takes a strong person not to be threatened by my family. ‘I’d like to marry, but I want to concentrate on my career first [a line of hair products], as does he.’ Her TV career to date has included fronting the Red Bull air race and presenting the Formula 1 coverage for GMTV. ‘I presented Formula 1 on Sky Sports Italia in Italian for two years, so I can’t be a complete moron,’ she said.